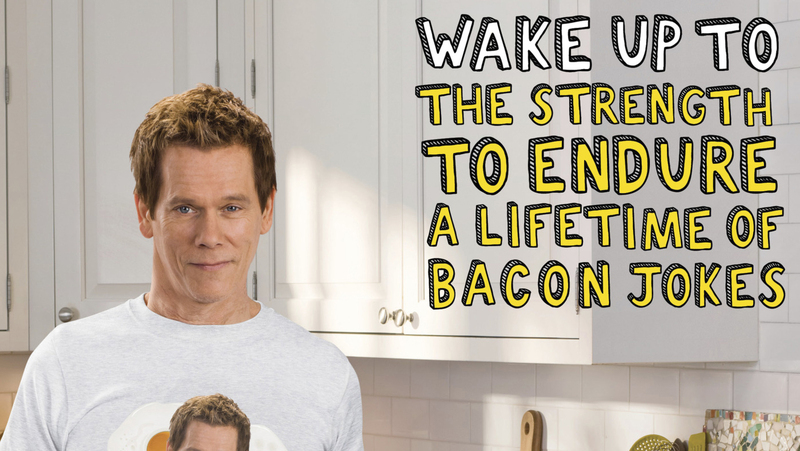 The egg industry is ordering up a side of Kevin Bacon. The American Egg Board says it plans to launch a print and online ad campaign this week featuring the "Footloose" actor and puns using his last name. The group says it's the first time it's using a Hollywood celebrity in a major marketing push. The campaign comes at a promising time for the egg industry, with the nation's protein craze helping fuel sales after decades of eggs being viewed as cholesterol bombs. The online spots feature a woman making scrambled eggs for breakfast, when Bacon appears lying suggestively on the counter behind her. At one point, she leans in to sniff the actor and says she loves the smell of bacon, when her husband walks in. The "Wake Up To Eggs With Bacon" push by the ad agency Grey is an update on the "Wake Up To Eggs" campaign that launched in 2012. Bob Krouse, CEO of Midwest Poultry Services, an egg producer in Mentone, Indiana, said he's glad the egg board is taking a slightly edgier approach in its marketing. "I always felt like egg farmers were too conservative," Krouse said. Already, the egg industry says it's seeing a recent uptick in consumption. Last year, Americans on average consumed 259.8 a year, according to a recent report from the U.S. Department of Agriculture. That's up from 249.3 in 2010, but still a long way from the levels before the 1970s, when people were consuming an average of more than 300 a year. People cut back amid warnings about the cholesterol in egg yolks. In 1976, egg producers got worried about falling consumption and formed the American Egg Board to promote eggs and fund research showing their nutritional benefits. More recently, the group says the industry is benefiting from the demand for protein, especially in the mornings when people are shifting away from carb-filled options like cereal. Then last month, a government advisory panel helping shape new dietary guidelines said the available evidence shows no significant relationship between heart disease and dietary cholesterol. So it said overconsumption of cholesterol is no longer a concern. "We think we're in the beginning stages of the most positive, long-term growth period for eggs in decades," said Kevin Burkum, senior vice president of marketing at the American Egg Board. Still, the egg industry -- in which about 175 companies account for 99 percent of the laying hens -- is also dealing with new regulations and scrutiny over animal welfare. A law that went into effect in California this year requires egg producers to give chickens enough room to stand up and spread their wings. Paul Shapiro, vice president for farm animal protection at the Humane Society of the United States, said the law was interpreted by many at the time of its passage to mean chickens should be cage-free, but that some egg producers have since disputed that position. Although the egg industry has been moving toward cage-free chickens, Shapiro said the vast majority of eggs in the U.S. still come from chickens kept in cages.